So far, astronomers have found evidence of black holes in lots of places in the observable universe (the part we can see from Earth using powerful telescopes and other instruments), and a special type of black hole—supermassive black holes—in the center of almost every galaxy, even our own. Our galaxy contains many less massive black holes, as well, which are the result of stars reaching the ends of their lives and going through a special process. In 1783, John Mitchell thought that something could be big enough and heavy enough (possess enough mass) that to escape from it, you would have to be traveling at the speed of light. Gravity becomes stronger with the more mass something has, so something with a lot of mass would make it very difficult to escape from it. You can see a demonstration of this in the huge amount of fuel it takes a rocket to travel away from the ground fast enough to escape the Earth’s gravity (caused by its mass) and enter space. That speed is called escape velocity. Mitchell also thought that some things might be even more massive and it would require more than light speed to escape. 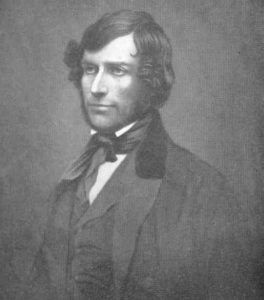 His theory originally caused some excitement in the scientific community, but when it was discovered that light has a wavelike pattern, many scientists decided that gravity could not affect it. They were wrong. In 1915, Albert Einstein was at work on his theory of general relativity. General relativity is a complicated theory that states that mass causes space and spacetime to bend or curve. Anything that is in motion will seem to “fall” along the curves, which is gravity at work. Secondly, light has a constant speed and if light seems to be moving at a different speed, it is on one of these curves in spacetime: it is being acted on by gravity. Soon afterward, Karl Schwarzchild (who was fighting in WWI at the time) found a solution to some of the equations Einstein published, and Johannes Droste came up with the same solution for one and wrote more extensively about it. There was something strange that happened with the equations that started to point toward black holes, but at the time, it wasn’t well understood what they were starting to discover. The unusual behavior of mass inside what became known as the Schwarzchild radius ended up giving us the term “singularity,” which is commonly used when talking about black holes. Several more scientists worked with the data and in 1931 Subrahmanyan Chandresekhar calculated that a white dwarf star would become unstable and collapse in on itself. Some people were against his ideas, but in the end they were both partly right. Some white dwarfs will collapse into a type of star called a neutron star; however, neutron stars above a certain mass will collapse into black holes, like Chandresekhar thought. A few years later, in 1939 Robert Oppenheimer and his fellow scientists believed that the singularity was a place on the edge of a bubble where time stopped. From an outside point of view, this is true. Stars seem frozen in time as soon as their collapse takes them into the Schwarzchild radius. But if you were falling into the singularity, time keeps going. David Finkelstein, in 1958, gave us another common term—event horizon—by taking Oppenheimer’s results and adding what would happen from the perspective of something falling into the singularity. The event horizon can only be crossed in one direction. Martin Kruskal had already found something similar, and all of these findings made black holes a mainstream subject of research. After this point, with lots of people interested, many scientists started to discover things very quickly and we gained a lot of our current understanding of black holes. They have remained an extremely interesting subject for physicists and astronomers and new discoveries are still being made, plus there is a lot we still don’t know! 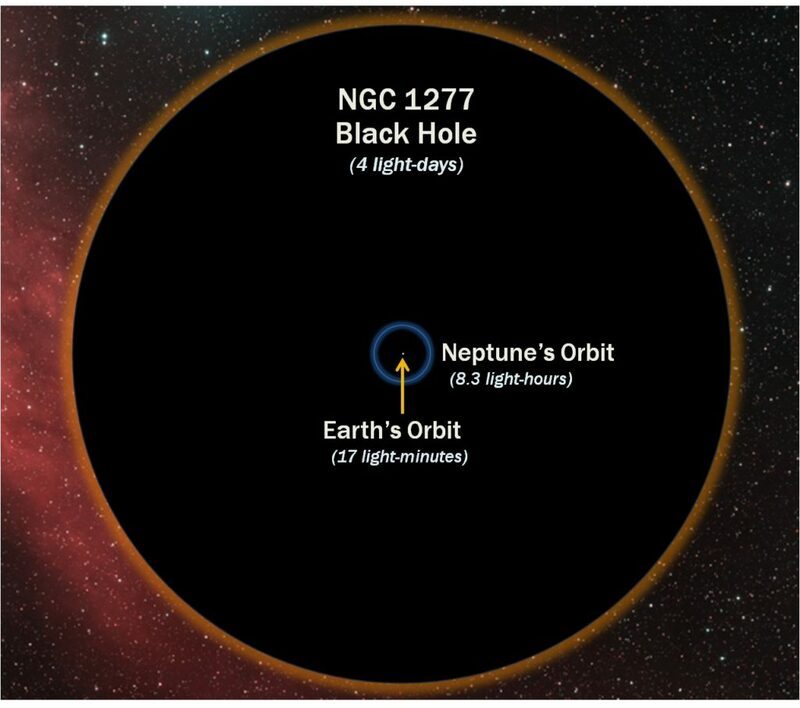 This is NGC 1277, the biggest supermassive black hole ever discovered. Supermassive black holes generally formed when the universe was still young. Once a black hole exists in the center of a galaxy, it can continue to grow by pulling matter from the universe around it and by absorbing other black holes, increasing its mass. However, astronomers are not entirely sure yet how supermassive black holes form. The kind that are made from stars dying are very small in comparison, so they think the two may form through different ways. The gap between these black holes that are made through star death and the smallest supermassive black hole is the difference of something about 33 times the mass of our sun and something 100,000 times the mass of our sun. Intermediate-mass black holes are what might bridge the gap in size between stellar black holes and supermassive black holes. They’ve been an important research topic because they may be the seeds that eventually grow into the supermassive ones that galaxies form around. Astronomers thought they probably existed but it was hard to prove whether one did or not until research started to come in over the past few years. In 2014, astronomers found what seemed to be one in the arm of a spiral galaxy and most recently, in research published in February, 2017, scientists found one in the globular cluster, 47 Tucanae, that has a solar mass of 2,200. Generally, scientists find black holes by looking from X-rays coming from a hot disk of swirling material somewhere out in the universe, but this only works if the black hole is actively feeding on the nearby gasses. Inside the center of 47 Tucanae, there is no gas, so the black hole is unable to feed and isn’t electromagnetically bright. This made it even harder to find. 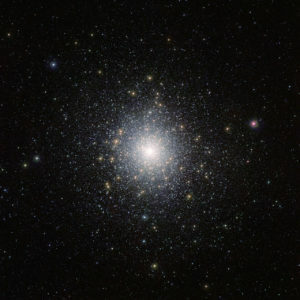 47 Tucanae is incredibly crowded with stars. The crowding means that the stars with greater masses tend to sink to the middle of the cluster, like something heavy settling in a glass of water. The intermediate-mass black hole is capable of causing those stars to spin around it, moving at higher speeds and greater distances. The second piece of evidence for its existence are the pulsars in 47 Tucanae. If there were no central black hole, they would be close to the center of the globular cluster; however, they get thrown around by the black hole’s gravity and are farther away than they should be if there were no black hole. This is compelling evidence for the existence of an intermediate-mass black hole, and these and other recent findings will help other astronomers find more now that they have an idea of what sorts of things mean an intermediate-mass black hole might be hiding somewhere. These are the most common black holes in the universe. “Stellar” just means “star,” and these black holes are one possibility of what happens when a star dies (white dwarfs and neutron stars are other possibilities, as well as the still-theoretical black dwarf). They generally happen when massive stars collapse. If the stellar remnant retains a sufficient amount of mass it will continue to collapse until a black hole is formed. In the early universe, there may have been many very massive stars, and so stellar black holes may have been common. One theory is that these were the seeds of supermassive black holes, hungrily feeding on the gas clouds and other particles that were common in the early universe until they became massive, themselves. These are very tiny black holes theorized to have been created in the early universe, usually. Just as big ones may have formed back then, tiny ones could have, too, and in some people’s opinions, would be much more likely than large ones. Since they’re so small, some people, like Stephen Hawking, think they would evaporate right away, but it’s possible that if they exist, they are still hanging around in the universe today. Physicists are on the lookout for them via looking for bursts of gamma rays shot out when they evaporate to see if they can find any. Gravitational collapse, like what can happen to stars, causes most black holes. In the beginning of the universe, after the Big Bang, the universe itself was very dense and hot. In that sense, it was similar to a star. Simple fluctuations in the density of the matter in an area could have caused the matter to collapse into a black hole. Since the universe is expanding, very dense regions dispersed quickly, but if one of these early black holes were powerful enough, it could remain stable and continue to exist into the present. Currently, they are still only theoretical. Once a black hole has formed, it can grow by absorbing more matter. The universe is full of gas, interstellar dust, and radiation, and a black hole will absorb all of these. It is generally believed that this is how supermassive black holes become so massive: they simply eat their way there. Other than that, black holes can merge with things that come within range of them, whether that be to stars or other black holes. This is another theory for the size of supermassive black holes, as well as how some intermediate-mass black holes reach their mass. 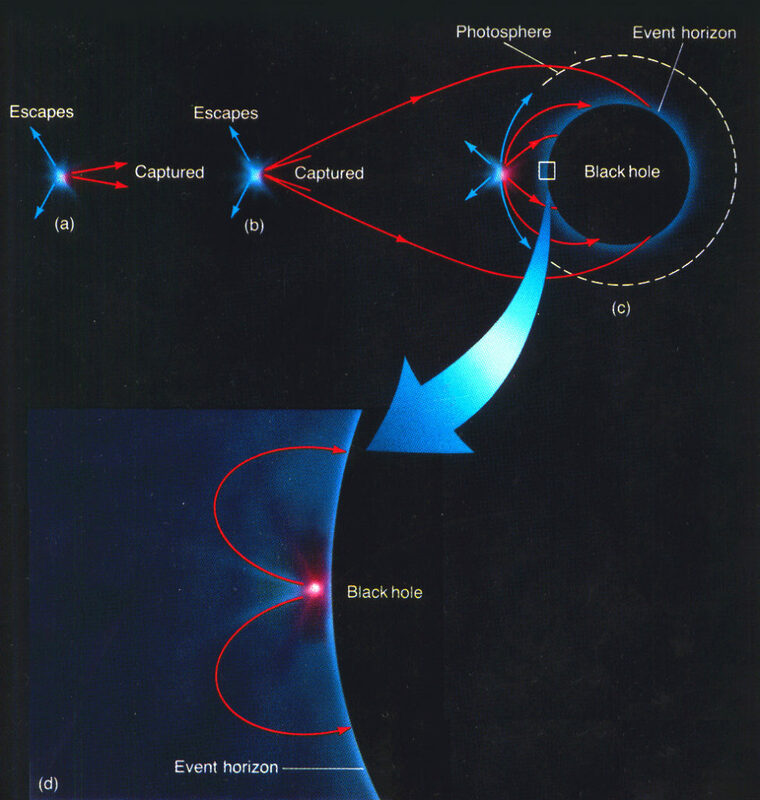 This diagram above shows the light trajectories as an object or star gets closer and closer to the black hole. In point (a), only a small portion of the light is directed close enough to the black hole to be captured. In point (b), the star is close enough that the amount of light captured is increased because of the strong gravitational field of the black hole that bends the paths of the photons inward toward it. In point (c), the star is much closer and this bending is so strong that fully half the light is captured. The amount of light captured goes up further as the star approaches closer, until in point (d), nearly all of it does – just a little that happens to be emitted directly outward can get away. Despite being described as massive, or even supermassive, black holes generally are not very large in the usual sense of the word. There is a difference between mass and size. Think of how a beach ball is big but doesn’t weigh very much compared to a brick. The brick has more mass because it’s very dense compared to the beach ball. Black holes are extremely dense and exert an extremely strong gravitational force. It’s this gravitational force that pulls things toward them and makes it impossible for things to escape. 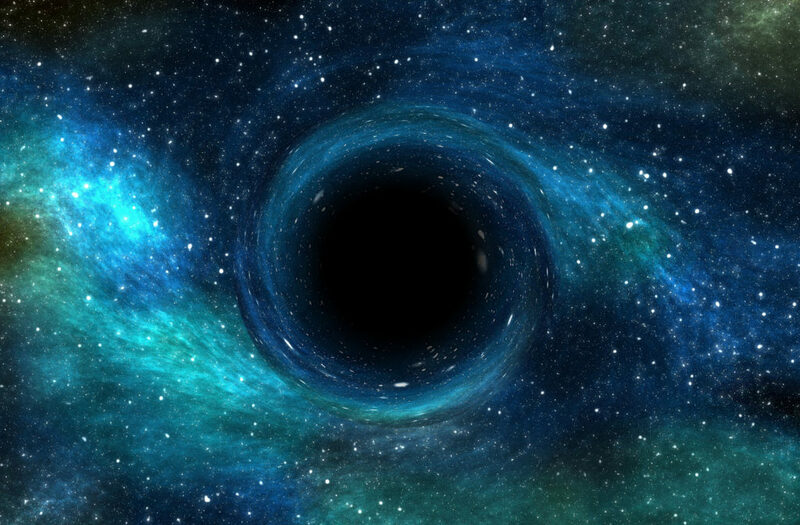 Black holes are made up of their event horizons and singularities. The exterior event horizon surrounds the black hole and forms the boundary line for it. Anything that crosses that boundary, whether it’s light or anything else, is drawn into the black hole’s singularity and cannot escape. Past the exterior event horizon is the inner event horizon. This is what you would find once you had crossed the exterior event horizon and had begun falling toward the singularity. The theories are so new that it’s hard to say anything about it yet, but research is ongoing. Inside the singularity, none of the laws of physics and spacetime as we understand them apply. This makes them both fascinating and very difficult to understand. Since nothing can escape from them, we currently have no way of understanding what happens inside of them except theories and guesses. 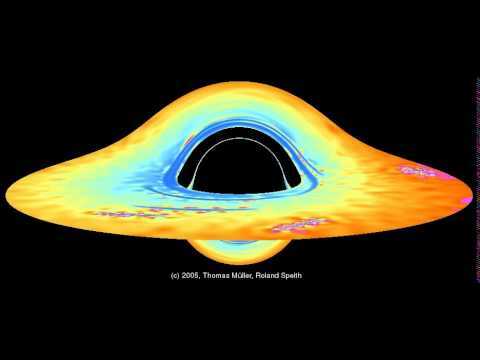 Black holes are usually surrounded by an accretion disk. These are disks of interstellar material, particles, and gasses that spin around the black hole—often very fast. You may dropped a coin in a big funnel at school or a museum where it circles around the funnel, faster and faster, as it’s drawn down toward the bottom and into the collection area. Accretion disks are like this, with a lot of particles in them circling around. The accretion disk radiates X-rays, helping scientists guess a black hole might be nearby. Some black holes also have quasars around them. Quasars are found surrounding supermassive black holes at the centers of galaxies. They emit very large amounts of electromagnetic energy, light, and radio waves. 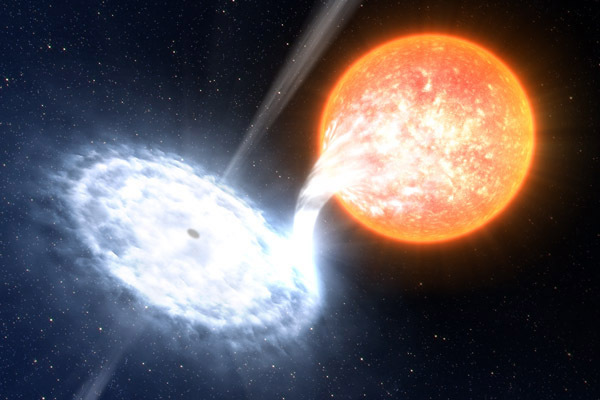 Quasars are thought to form when galaxies collide and their black holes combine. Over time, they consume the region of the galaxy around them and stop emitting so much energy. As long as there is something nearby for a black hole to absorb—interstellar dust, gas, nearby stars or other black holes—it will continue growing and thriving. Stephen Hawking believes that black holes that are rotating, like most, should always be creating and shooting out particles. If the black hole has nothing to feed on, this process of shooting out particles would cause the black hole to shrink and eventually disappear. There is a telescope currently looking for evidence of this, and scientists are also curious to see if they can observe the process using the Large Hadron Collider, which is the largest machine in the world. Scientists use it to cause particles to smash together at very high speeds. Some people got worried that the Large Hadron Collider would create black holes powerful enough to cause trouble on Earth, but physicists have reviewed all of the research very carefully and believe that if they do create any, they will evaporate so fast that it won’t be a problem. What Would Happen if You Flew Into A Black Hole? A lot of people wonder what would happen if they fell into a black hole. The gravity toward the center of the singularity is so strong that anything that begins to enter it is stretched out due to the gravity pulling on the nearest end. Astrophysicists call this “spaghettification” because the object is pulled out like a long, thin piece of spaghetti. There is nothing in the universe strong enough to avoid having this happen because black holes’ gravity is that much stronger. While this might sound scary, it isn’t going to happen to anyone. While there are a lot of black holes in our galaxy and a supermassive one in the center of it, they are all much too far away to affect humans. Since black holes fascinate so many physicists, they are a popular topic for study. In the past hundred years, we have come up with many theories, and proven some of them. A special project called the Event Horizon Telescope, which is made of many radio observatories around the world combining their power to create something like a telescope as wide as Earth, is aimed at studying our galaxy’s supermassive black hole. The first picture of it may be able to be produced in Spring, 2017, and that will give us tons of new information to study, confirm theories, or correct them. It’s a very exciting time for black hole research!